Glamour Day Spa - Rt 739 in Lords Valley Shopping Plaza, Lords Valley, PA 18428 - 570-775-9270 Therapeutic Massage, facials, pedicures, manicures, waxing, tanning and acrylic nails.One time usage of the spa or packages for services are available. Massages 30 minutes to 120 minute massages including deep tissue and hot stone in a relaxing atmosphere. Pure Day Spa 770 main Street Stroudsburg, PA, 18360 570.420.1818 We pride ourselves in creating a spa experience that invigorates and restores balance and energy to the mind, body, and soul. With all the pressures and stresses in today�s lifestyle, you can relax in our spa and enjoy being pampered by our staff. Whether you are a first-time guest or a regular client, our staff promises you a cultivating experience to revitalize your spirit, enhance your beauty, and fortify your well being. 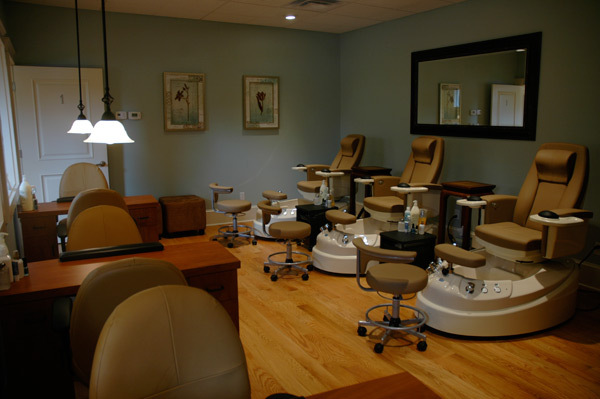 Shear Design Spa - South 6th Street, Stroudsburg, PA. Salon and Day Spa. For Stay and Spa Packages see PoconosSpaPackages.com Nestled in a beautiful historic building on a quiet street in downtown Stroudsburg, you will experience an unparalleled value in salon and spa culture. For over 20 years, Shear Design Salon has been on the cutting edge of the industry. Founded on the commitment to continuing education, they strive to bring fresh, modern hair design to the greater Pocono region. In 1998, the day spa was created to meet the needs of our ever changing and growing community. Through training and the latest in technological developments, they are committed to the standards of the European Spa, for superior individual care and consistent service execution. The staff at Shear Design is experienced and highly trained. The Aestheticians and Therapists are certified in their field of specialization, and the Salon Design Team is trained in New York, London and Toronto. They are committed to providing an atmosphere of genuine caring and concern for your safety and well-being. The smoke-free policy and the use of environmentally safe products allow you to breathe easily during your visit. Any equipment used during your service undergoes intensive sterilization. Visit PoconosSpaPackages.com for more information on packages at Shear Design. Spa Shawnee at the Shawnee Inn and Golf Resort. Shawnee on Delaware, PA 570-424-4000 For the best Poconos spa resort consider Spa Shawnee at the Shawnee Inn and Golf Resort. Known as the premier spa getaway in PA, the Shawnee Inn and Golf Resort is the place to be in the Poconos for Spa vacations. Spa Shawnee and Salon is a wellspring of relaxation. Sheltered within a tranquil landscape in Pennsylvania, it is a place where guests can find space to close the door of their daily lives and open themselves to their inner peace. All Natural and Organic By only using the best all-natural and organic products on our spa guests, Spa Shawnee captures the essence of spa treatments the way they were meant to be experienced. Complimenting this with the philosophy that everything placed on the body goes into the body, it is not hard to understand why we place product purity on such a pedestal. Spa Shawnee and Salon�s menu features treatments that focus on purifying the mind, body, and soul. Our 3,200 sq. ft. facility includes three single massage rooms; one couple�s massage room, a hydrotherapy room, full salon, and manicure/pedicure station. . Ahhh, green. Against the backdrop of the Delaware River and Appalachian Mountains, enter a bountiful environment that will bring the essential natural elements together, giving the perfect experience to your body, mind and soul at this Pennsylvania spa. Discover Spa Shawnee and Salon located in the historic Shawnee Inn and Golf Resort, nestled along the Delaware River in the Pocono Mountains. In our dedication to reduce our environmental footprint, we use only eco-friendly products, whenever possible. This year we are unveiling several new and exclusive treatments using locally sustainable goods. Enhance your wellness and balance naturally.